HTC today officially launched HTC U11 Smartphone. It comes with a Snapdragon 835 Processor,12M Rear camera and 6GB RAM. 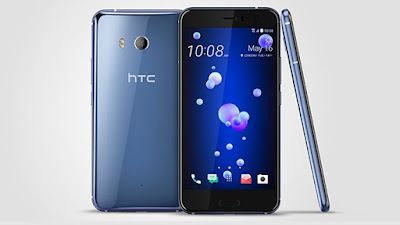 HTC U11 feature a 5.5-inch (1440 x 2560 pixels) Quad HD Super LCD 5 display with Corning Gorilla Glass 5 protection powered by a 2.45GHz Octa-Core Qualcomm Snapdragon 835 MobilePlatform with Adreno 540 GPU with 4GB/6GB of RAM and 64GB/128GB of internal storage expandable up to 2TB with MicroSD card. It has USB-C audio and the new HTC USonic combines Active Noise Cancellation with the ability to tune audio to your unique hearing. It uses built-in microphones on the headset and USB-C data connectivity, USonic earbuds map inner ear with an advanced sonar-like technology and then adapt the sound profile to your unique biology.It also offers Active Noise Cancellation, which reduces disruptions and distractions around you so you can stay focused on your music. It continuously monitors environmental sound levels and quickly adjusts to any new noises or disturbances. HTC BoomSound Hi-Fi Edition speakers promise more loudness and better Dynamic Range Audio. It has four optimally positioned omni-directional microphones that work together to record audio from all directions, and when shooting video with Acoustic Focus, you can visually zoom in to target your subject and amplify their specific sounds. It also comes with an USB-C to 3.5mm adapter with a built-in DAC. It has HTC Sense Companion, Google Assistant, and Amazon Alexa. In China, it comes with Duer AI Assistant: Powered by Baidu DuerOS. HTC U11 comes in Amazing Silver, Sapphire Blue, Brilliant Black, Ice White, and Solar Red, and will start rolling out in select countries from next week and will be available worldwide from June, 2017. It is priced at €749 in Europe, £649 (Rs. 53760) in UK and $696 (Rs. 44595.) (Only with contract currently) in the U.S. India will get the 6GB RAM with 128GB storage version soon.